Fundraising is often the most daunting part of a Helping Hands (or any) event. Trust us, we understand. BUT we are also here to tell you that raising money for your meal packaging event doesn’t need to be so scary. Collectively, parishes and groups have packaged over 7 million meals in 7 years – here are the many ways they have raised funds to do it! If your Pastor has a percentage or funds set aside for projects that including helping the community at large Helping Hands is a great fit. These funds are often procured through designated second collections and we have met a number of Pastors who designate a percentage of their yearly collection total to poverty-focused programs. There are countless organizations that love to give to nonprofits for poverty, feeding and sustainability programs. While getting donations and grants can take time it’s incredibly worthwhile and often pays for your entire event. Here are some creative ways we have seen this work. Remember businesses both want and need to give donations during the year; beyond philanthropy being important, tax deductions are great incentives for financial donations. A pastor in the Northeast gets grant from local businesses and invites a select amount of people to partake in the packaging each year. It takes a few businesses to find the right fit but he is largely successful in this endeavor. Many groups ask their parish Council of Catholic Women or Knights of Columbus for donations. A community in the Midwest calls local restaurants and asks for donations of specific food items (spaghetti for 200, salad for 200, dessert etc). Once they find enough donations for a church dinner they pick a date and invite their parish to come for a fee – this funds their event. One parish has a hot chocolate bar a few weekends during the month – the cost for the hot cocoa is nominal and funds and donations make up a good portion of their fundraising needs. Many parishes hold silent auctions. While this can be a lot of work, if you have a team and they are willing to call local businesses for donations of items (gift certificates to restaurants, spa gift certificates, art, trips etc. 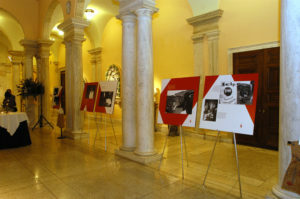 ), silent auctions can be extremely lucrative in raising funds. Another pastor does Helping Hands events as part of Confirmation during the Lenten season. 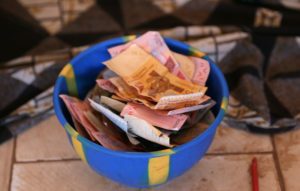 He asks all confirmation participants and their sponsors to tithe during the Lenten season for their event and to donate funds from that tithing. Without a doubt, the easiest way to go is to have your parish take part in each aspect of the event, from the planning. to the donations, to the event itself. While there isn’t usually room for every parishioner to pack meals, there is certainly room for everyone to give of their time, treasure and talents. When you decide to do a Helping Hands event we have a wonderful system that allows your volunteers to both sign up AND donate online; this takes the work out of it for you! Many parishes also like a “hands on” approach to donations and spend a few months before an event collecting funds after masses. Our favorite idea is the “parish big board”. Photo courtesy of Holy Name of Jesus. 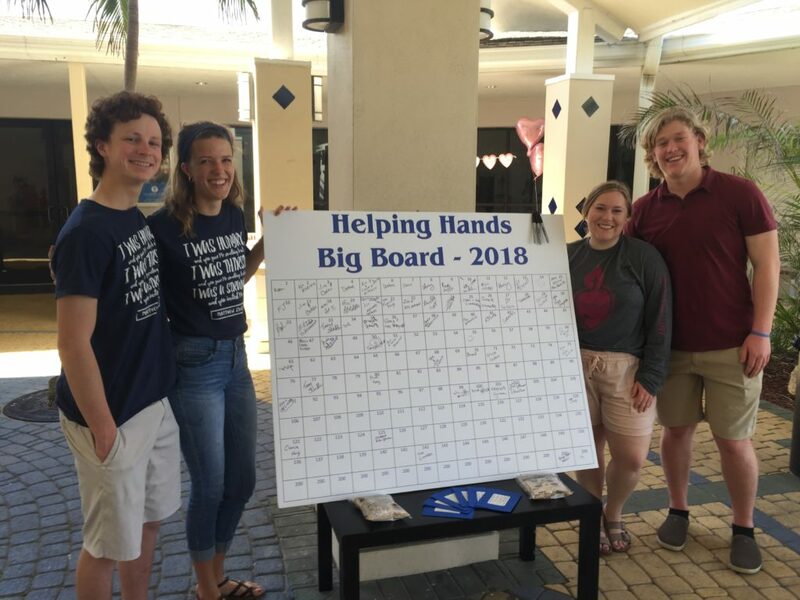 The big board (originally shared with us from the Holy Name of Jesus Indialantic, Florida parish family) is just what it sounds like. A big board of numbers. The numbers, hands, squares, paint chips etc. are all removable andhave various amounts that a person commits to. Each person takes their amount, writes their name or initials or prayer on the piece until a board is filled up. Usually a board is created to equal $5,000. It’s amazing how quickly donations of $5, $20 and even $100 get snapped up by parishioners and a wonderful way for everyone to be engaged. 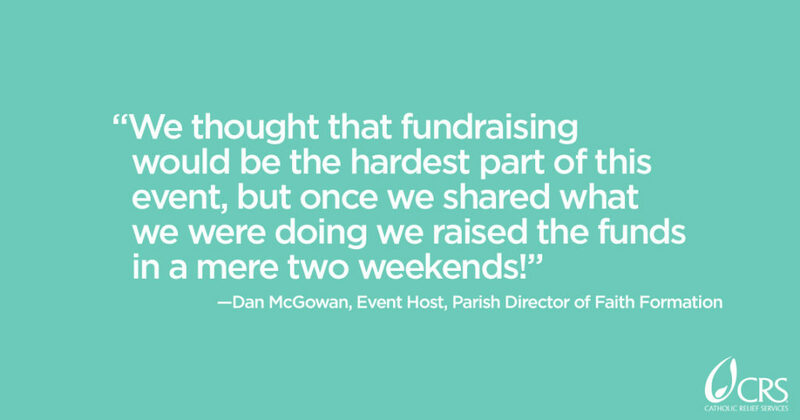 It’s simple, don’t let fundraising be a non-starter for your event, make it fun! Talk to your Pastor, find support in your community and let us know how you too raised funds for your Helping Hands meal packaging event, we love to share! And don’t forget our online toolkit that has many more ideas to making raising money easy!